Margie’s says: If you’re like me, you have tons of content that you’d like to reuse, but not sure the most efficient way to go about it. 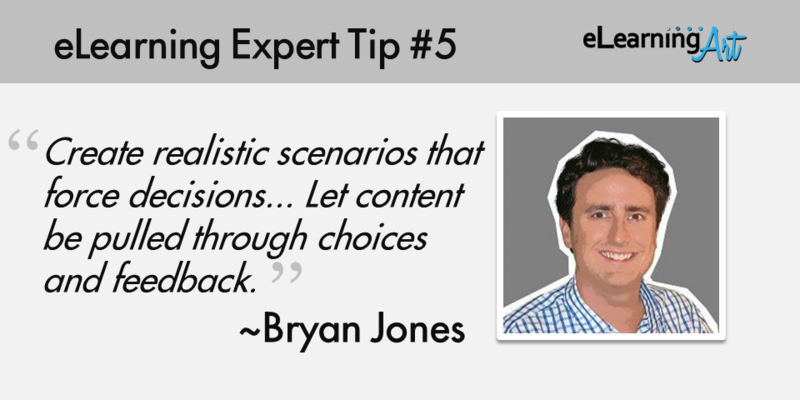 Bryan Jones, founder of eLearningArt, is a pioneer in eLearning and instructional design. 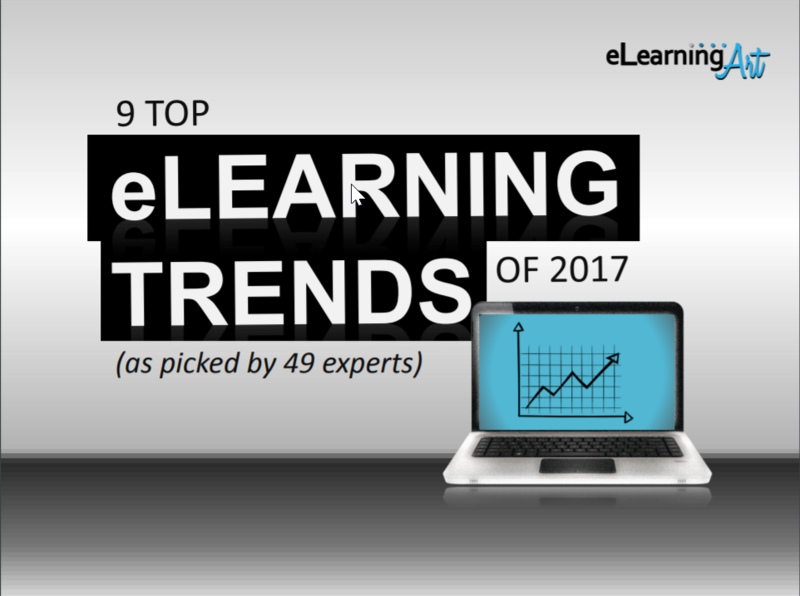 His company, eLearningArt, is the leading provider of eLearning images and templates for the eLearning industry. 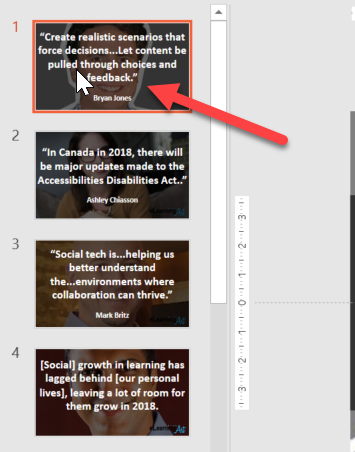 Bryan’s resources have saved me tons of time over the years, so I asked him to share some tips he recently featured on his blog, elearningart.com. You can also catch Bryan and me chatting about learning, technology, AI, and the brain on our podcast. 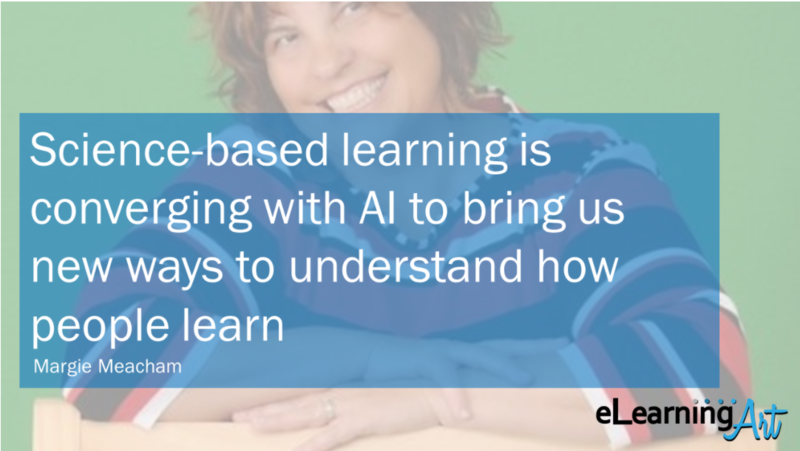 The following article is reposted on LearningToGo.info with author’s permission. Thanks Bryan! The purpose of this quick start guide is to move from the #8 trend of “science-based learning” to action. Brain science supports the idea that content needs to be repeated to open and widen multiple neuropathways to the same information. . In fact, it’s the strategy I use as a marketer to reach my audience through different media. So I’m going to walk you through a repurposing strategy that allows you to improve, expand, and repurpose content quickly. The science of evolution and how brain developed. In my interview with Margie she talked about the importance of “repeat, repeat, repeat” content to learning. She discusses how our brains were designed to keep us alive, so we’re constantly distracted during learning as we subconsciously scan our environments to danger. Repeating content through different media opens and widens neuropathways to make your content stick. So let’s start creating multiple formats of a single piece of content! The best place to start is to look at where you’re at with existing content and see if there’s an opportunity to improve, expand, or repurpose your content. 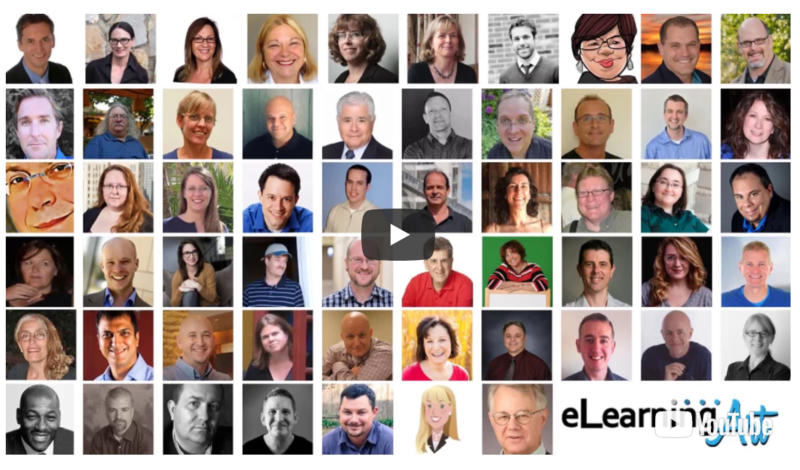 Our plan with the microlearning content was to just distribute via email. But let’s evaluate this in a larger context. 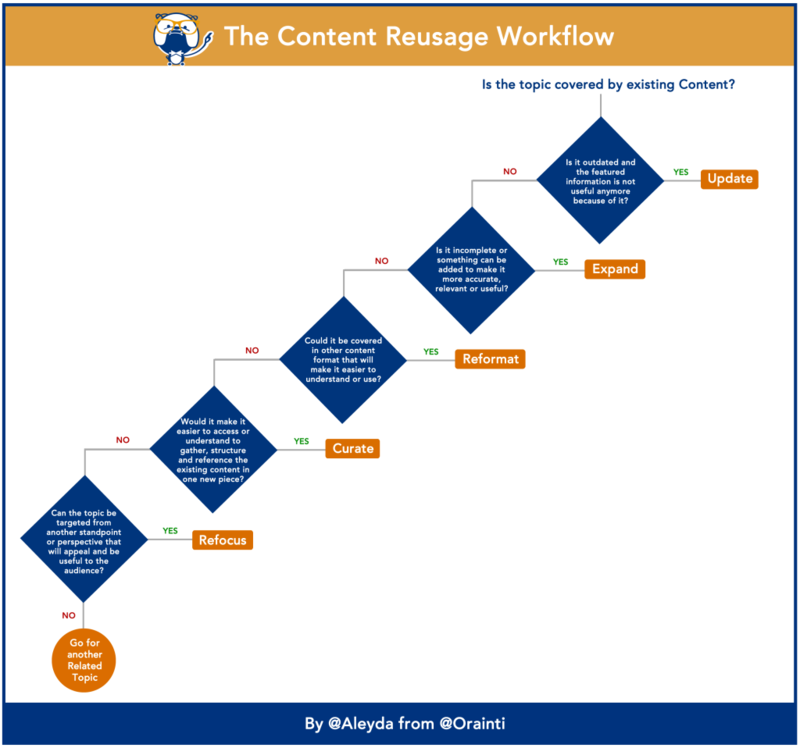 I really like how Aleyda Solice thinkgs about new content by first looking at her content repurposing workflow. It could be a ton of things, like a job aid, knowledge base, etc, but let’s just go with the 3 above. If you only end up with 6-7 experts, no biggie. 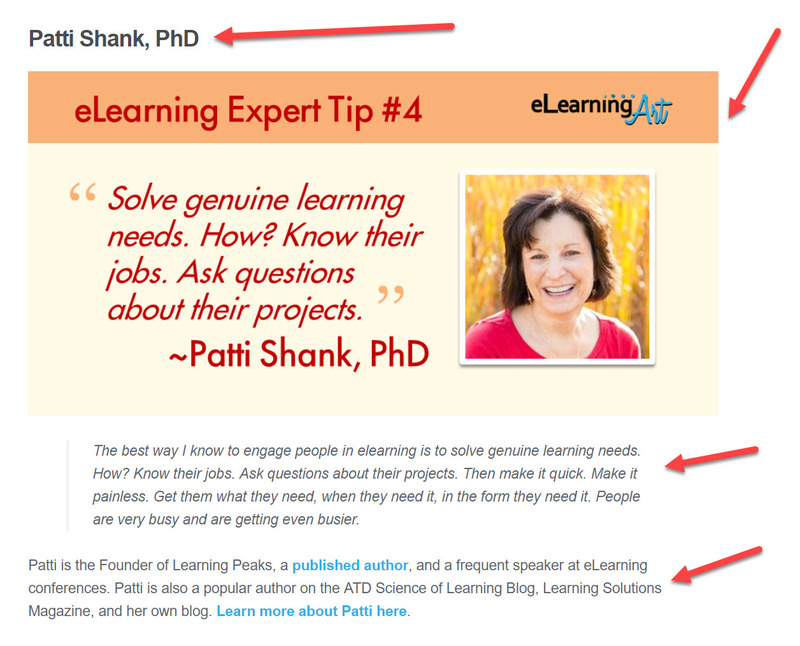 You certainly don’t need to go overboard and do the 50+ experts that I often get for my roundups. ? 10 is a nice round number that feels substantial. Take that same ”Goldilocks” question template and email template from the microlearning tutorial. I’m working on a quick lesson to help [new customer service reps] do their job better. I’m hoping to get 5 minutes of your time to share your experience. Can you please answer this one question for me? What’s your #1 tip for [ACME customer service reps] to [handle an angry customer]? Again, this shouldn’t take you more than 5 minutes. I only need a few sentences (50-100 words). Please just reply to this email with your response and I’ll get it out to the team. Did you send it yet? Nice work! ? As a marketer, I’m constantly looking for ways to repurpose content. And not just repurpose, but cut down production time. 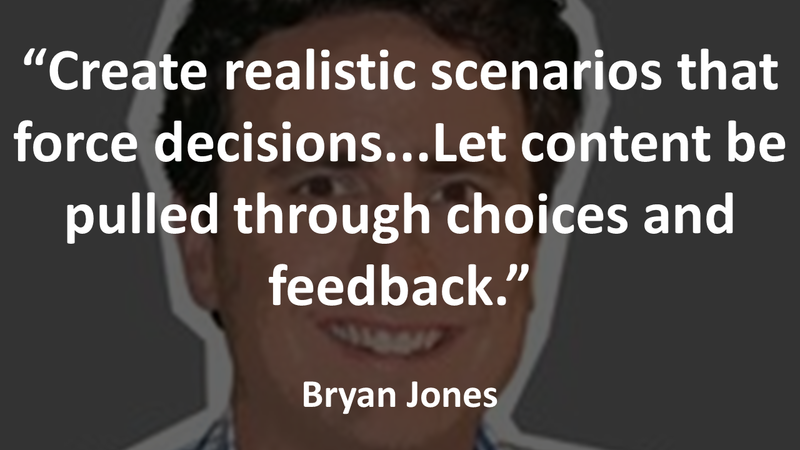 There’s no reason you can’t do this for training content as well. 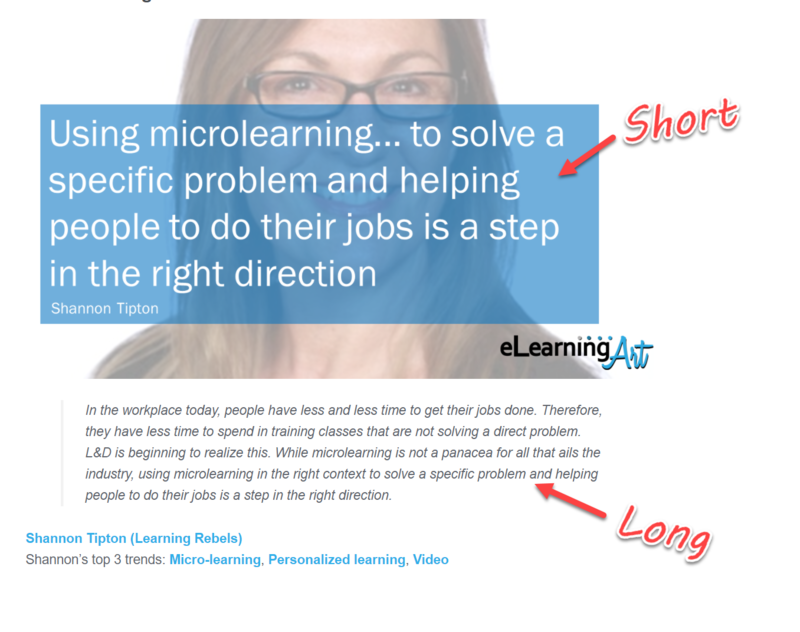 If you look at the quote graphics in the eLearning trends article, you’ll notice that they’re a 16:9 aspect ratio. 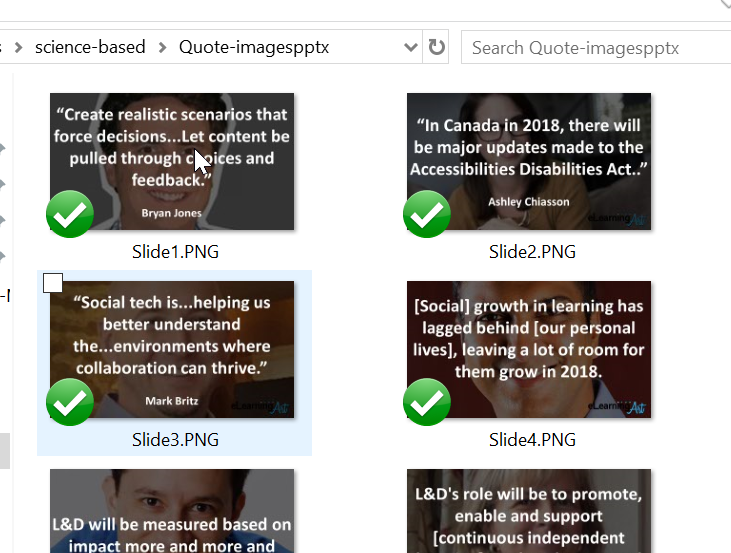 I created my quote images as 16:9 because I knew they’d fit perfectly into an overview video. And that I could repurposed them easily into the blog post to make the content more visual. In other articles, I’ve looked at the secondary content as twitter (rather than video). For those, I created the graphics in the optimal Twitter aspect ratio of 2:1. You’ll want to shorten the quote to about 100 characters. You can use this word count calculator to help with the length. I try to get as few words as possible that still makes the point. If you’re looking for examples of how to do it, check out some of my roundups that have quotes, here, here, or here. 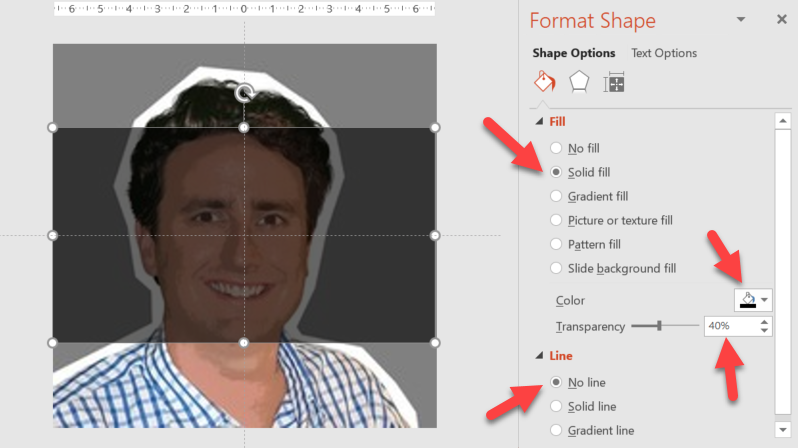 If you follow this blog, you know that I use PowerPoint as my main graphic design tool. Draw a rectangle over the image. Notice that the thumbnails on the left are the actual preview of the finished layout. 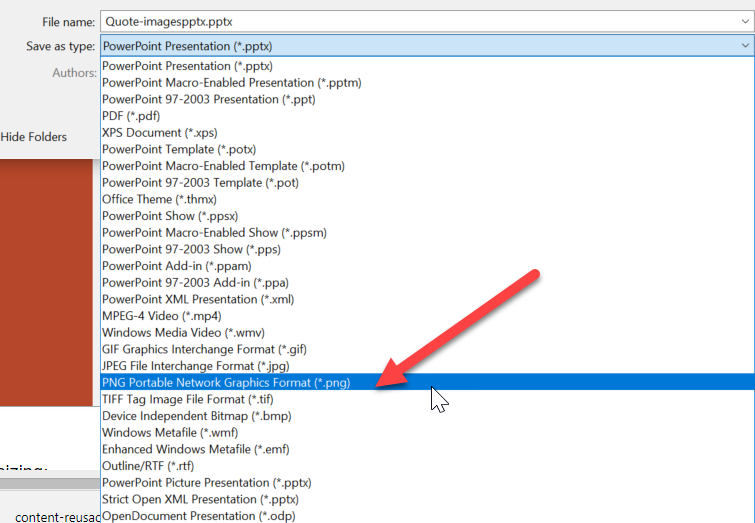 Then navigate to the folder and you’ll see you have all of the images! Boom! You now have your social images. 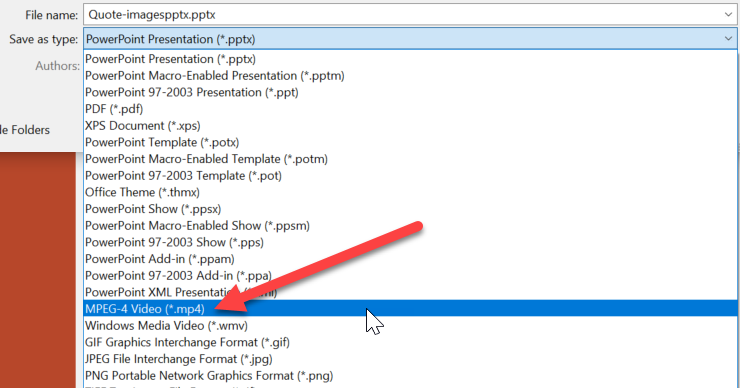 You might not know this, but you can use PowerPoint to create a video. The easiest way to do this is to click on any of the thumnails on the left, then do “CTRL+A” to select all. Navigate to where you saved the file. 6. You’re done with the video! 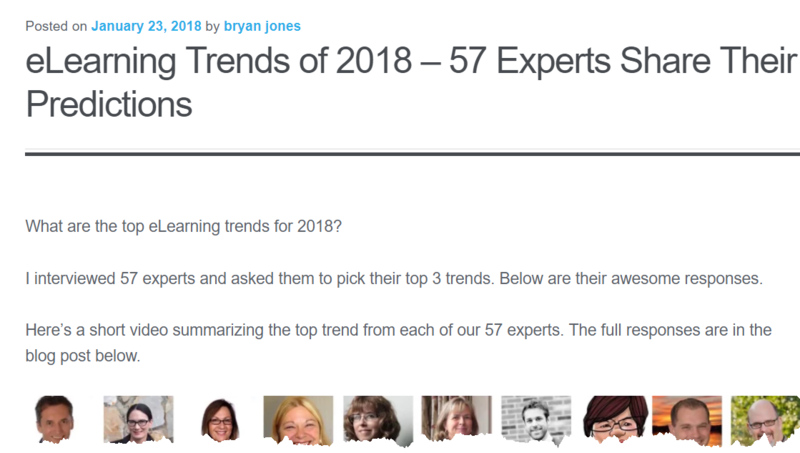 In the 2017 version of the trends roundup, I also included an ebook. I decided not to do it for 2018. Each expert got a single page the included both the highlight quote and the full text. There are a lot of options for repurposing the roundup content. Create a “drip” sequence of emails that go out with an individual tip during onboarding.. I hope you were able to quickly repurpose some content.